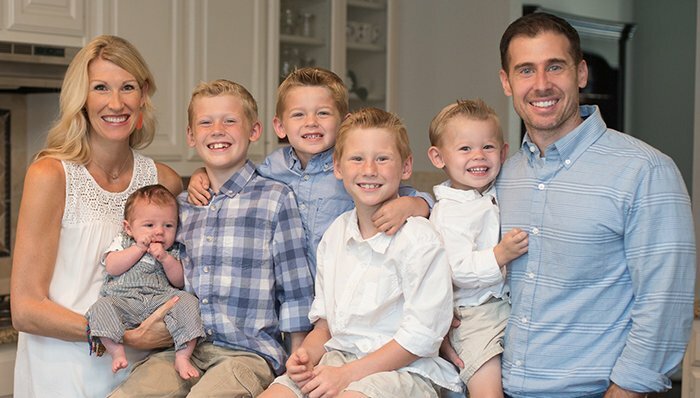 Julie Boto (left), GCU class of 2001, and her husband, Thomas, pose with their five sons. They are not only proud parents but also proud creators of an animated series of owls who spread God’s word. 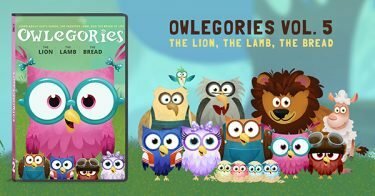 “Owlegories,” the popular Christ-centered video and app series that features a parliament of animated owls. Meet the creators, Julie Boto, a 2001 Grand Canyon University business and marketing graduate, and her husband, Thomas, a Texas attorney. They have five inspirations under age 9: Austin, Everett, Ian August (“Gus”), Owen and Uriah. Perhaps not coincidentally – there are also five young owls in the series, Joey, Twitch, Violet, Nora and Gus. “We wanted to teach our kids about God in a powerful and fun way and use characters that are fun and cute and the kids can identify with,” Boto said. 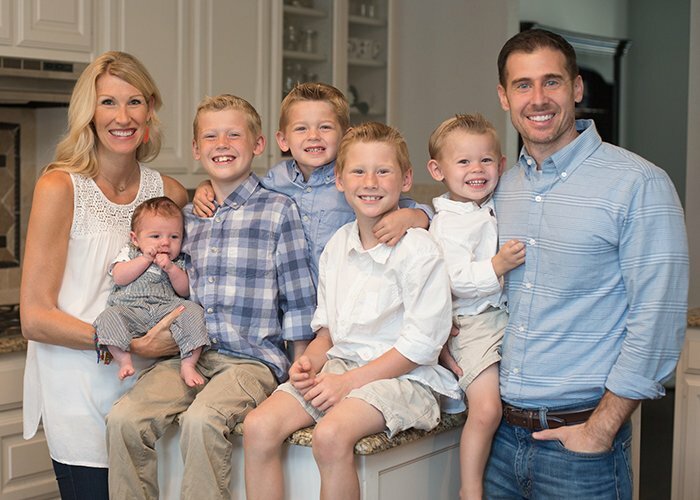 The idea took flight in 2012, when Julie and Thomas had three of the five sons they have today. Owlegories has since spread its wings from the original app to an animated series. Julie, whose maiden name is Napier, is a sports lover who grew up hunting, camping and fishing in Alaska with bald eagles and a strong desire to start her own business. Thomas’ family has a background in storytelling. Before they met through Julie’s brother-in-law in Lynchburg. Va., Julie already had built a resume by working for the Arizona Diamondbacks (and was with them when they won the 2001 World Series), Phoenix Suns and Arizona Coyotes, among others, and earned an MBA at Pepperdine University. Thomas was studying law at Liberty University, and Julie had landed a job there in the marketing department. “We played basketball together in our free time and discovered our mutual love for being outdoors and traveling,” Julie said. They fell in love and moved to Texas. Julie, who teaches international business online at Liberty, grew up watching her father run his own business. She always had wanted to run her own. At the same time, she also prayed for a large family. She and Thomas set out to create something that involved the whole family and spread God’s word. They came up with idea of the interactive Owlegories storybook app. Their aunts, uncles, cousins, nephews, children and grandfather all participated, but they also used professional actors. Among the roles in the family business are writing, editing, running the online store and helping with social media and marketing. To add another level of meaning to the videos, they reached out to the Christian community and asked pastors to expound on each lesson. “They really wanted to share the Gospel with the children,” Julie said. At GCU, Julie played women’s basketball and was involved in Bible studies and local ministry. Now, she said, she is excited for her children to visit her alma mater. “I would be happy for my children to go there,” she said.